One thing that I love about the process of home education is that so much falls under the heading of education. We can do something in the evening and it will fall under schooling. Take, for example, making dinner and/or cleaning it up. All part of what a home economics class would be. So is sewing. But sewing also includes design, textiles, and the actual construction of the product. That was what we did today. And, it was a project for a baby shower. How perfect! Learn and then bless someone else. All of us did some sewing for the baby shower but I am going to start with Miss E, since she is the middle schooler AND she did the project all on her own with only a little bit of input here and there or instruction when something didn’t happen quite like she expected. Her project was a personalized, light-weight baby blanket with a decorative border. She did a fancy zigzag stitch on the top of the blanket for hemming the edges. Then, she decided where she wanted the name, positioned the fabric, programmed the machine, and made sure it went right. It came out so sweet. I just know that it will be loved! Miss L decided that she wanted to make some baby washcloths. So she picked a super soft flannel and planned them double sided. She stitched the edges and then turned the square right side out. After pinning the opening closed, she then top stitched around the edges of the entire piece. They came out real cute! This baby is gonna enjoy the soft washcloths. Miss J made a burp cloth for the baby. She chose a soft flannel, as well, and added a ribbon embellishment to it. She then sewed the piece with the right sides together, turning it out and topstitching it to close and finish the piece. It came out just like she wanted it to, she says. So, we are ready for the baby shower now. A life of education that can couple with service or blessing others is definitely one that I hope the girls learn. And we are certainly on our way. Lots of sewing got done. Mainly because I knew I was going to be writing this post and I was bound and determined to have something to post. I have gotten two major projects dealt with, which makes me very happy. 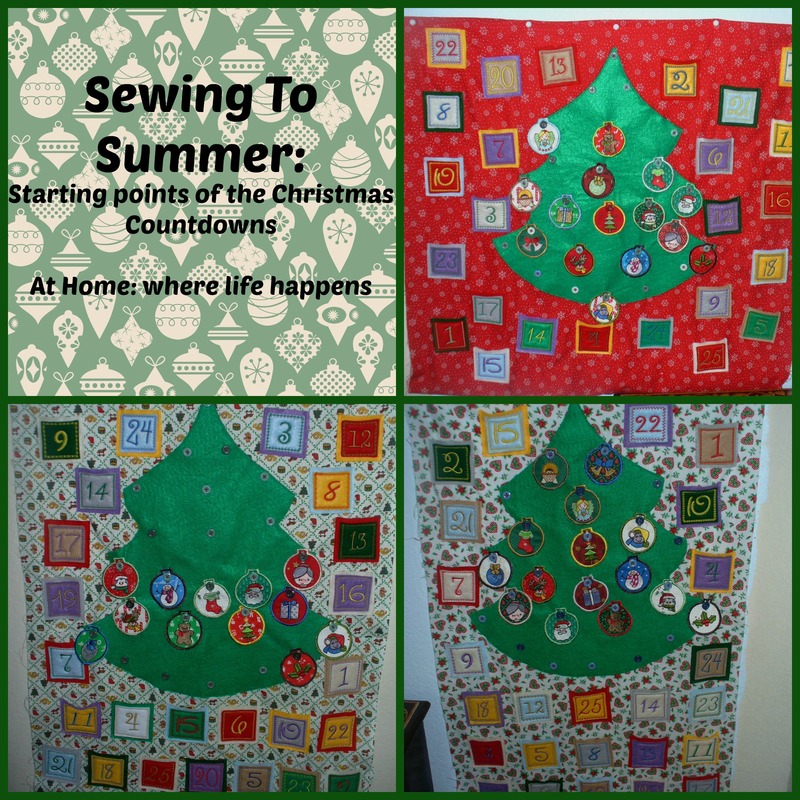 First, I got all of the button on pieces for the Christmas Countdowns completed. I am so happy these are done because, while super cute, they took a TON more time than I ever imagined. Second, the bedspread for my youngest giggly girl was completed. 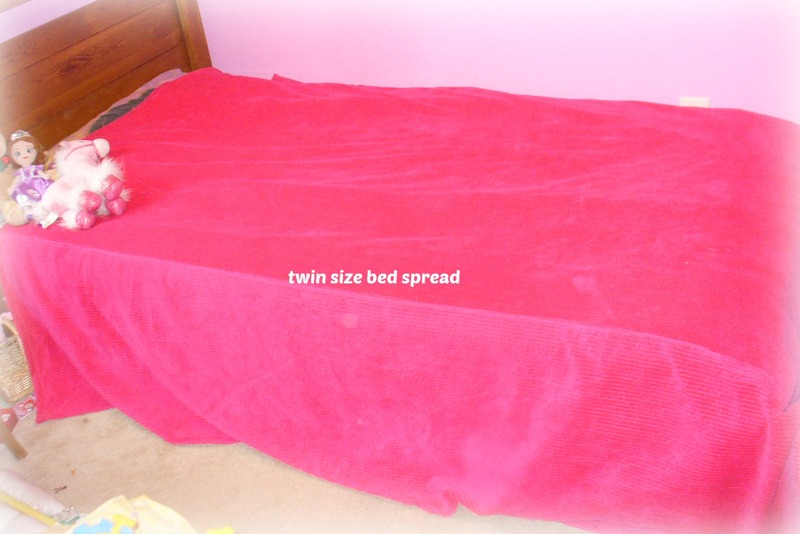 It was not a complicated one and I just winged it based on amount of fabric I had and the size of the bed (a twin). The fabric was free, gorgeous, and perfect for my giggly girl. The sheer size of sewing a covering for a bed was a new challenge to me but I am so happy with it. Most importantly, so is she! Birthday present – check!! That is the extent of this month’s sewing but again, I am pleased. A couple more projects are checked off of the list. 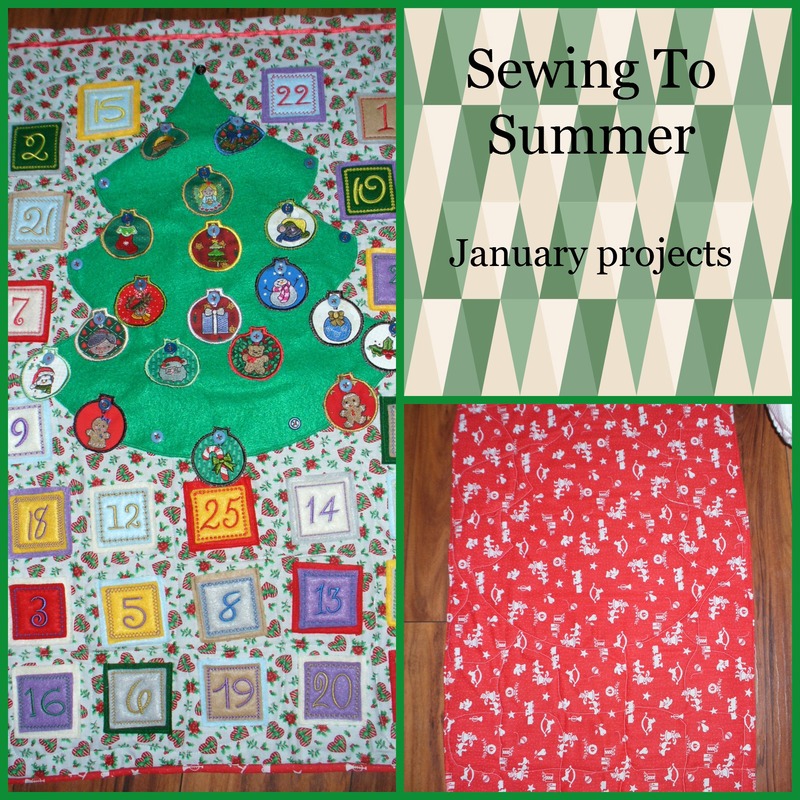 What did you get accomplished this month with sewing or other craft that you enjoy? At Home. Want more inspiration? Later today, I will be linking up at Milk & Honey Mommy who is hosting this challenge. Well, I have made a good start on the Sewing To Summer project. I got one afternoon of really good sewing in. Here is where I started with the Christmas countdowns for this project. Unfinished edges; no hanging pockets; lots of unfinished button-on ornaments. Lots needed done. That one afternoon was good and I made significant progress on the Christmas countdowns. I got one of the backgrounds finished. I also got 12 more of the little button-on ornaments finished. Progress!! That is actually all of the visible progress that was made. However, I also got a little bit of planning done. I made a trip to the fabric store because they were having an awesome sale on patterns. ($1 each up to 10!!!) I have hesitated to make the doll ball gowns that the girls have been wanting because I had not yet found a good pattern for one that I felt was complete enough to be able to do AND that they liked AND that I was willing to afford. (Sorry but I just don’t think that $16 for a few flimsy pieces of paper is worth it. Doesn’t matter how beautiful the doll dress may turn out.) So, armed with a choice of dress patterns and their fabrics, the girls sat down, oohed and aahed, and chose which pattern to use for their ball gowns. They also chose whose was going to get made first. Another big planning decision down! Milk & Honey Mommy to see what she completed this month. Don’t forget to come back next month to see if I manage to finish the countdowns and the doll dresses. Also, please comment and tell me what projects you have in your sewing bin. 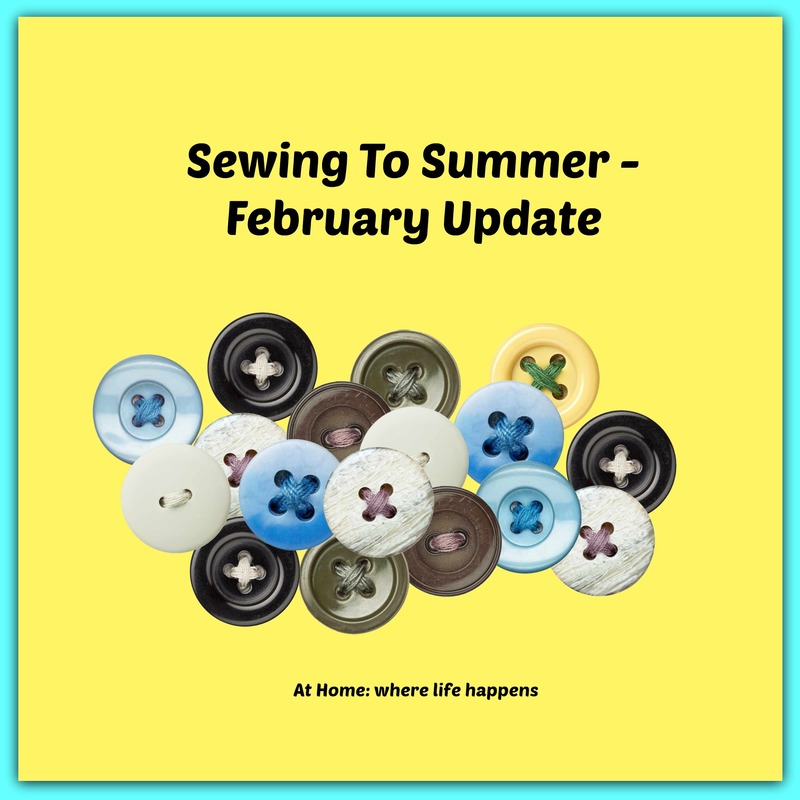 I’ll be sewing and waiting to hear what you are working on. At Home. I have had the pleasure lately of working on some projects for others. The start of a little bit of income and a whole lot of fun. I made these cute little bow centers for Fawny over at Fawny’s Girlz Designs. 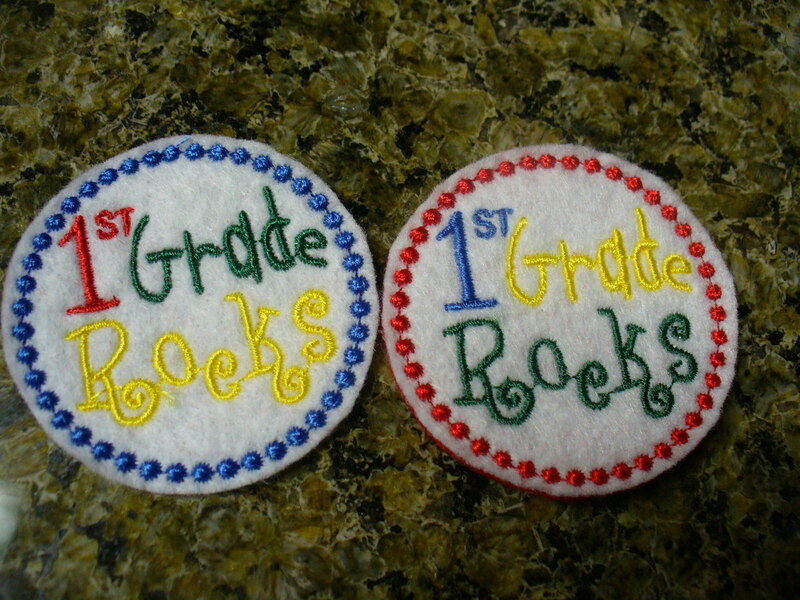 I made some that say Preschool, Kindergarten, and 1st grade. She’ll add them to some of her wonderful creations and some little girl somewhere will have a sweet new bow for school this year. 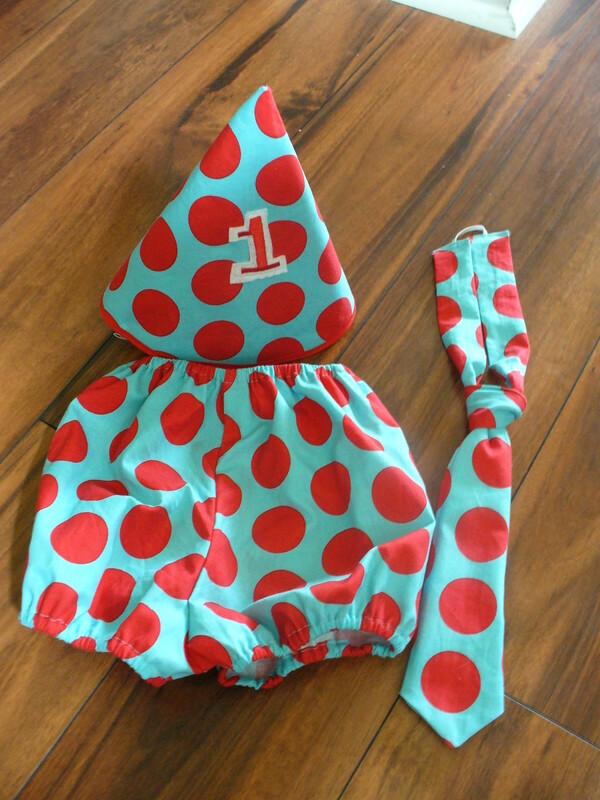 I made this little outfit set for a little boy who is about to turn 1. What a fun birthday set! I had never seen this kind of set before so when she asked for the custom creation, I had to do a little digging on the internet to get some ideas. I think it came out just darling!! 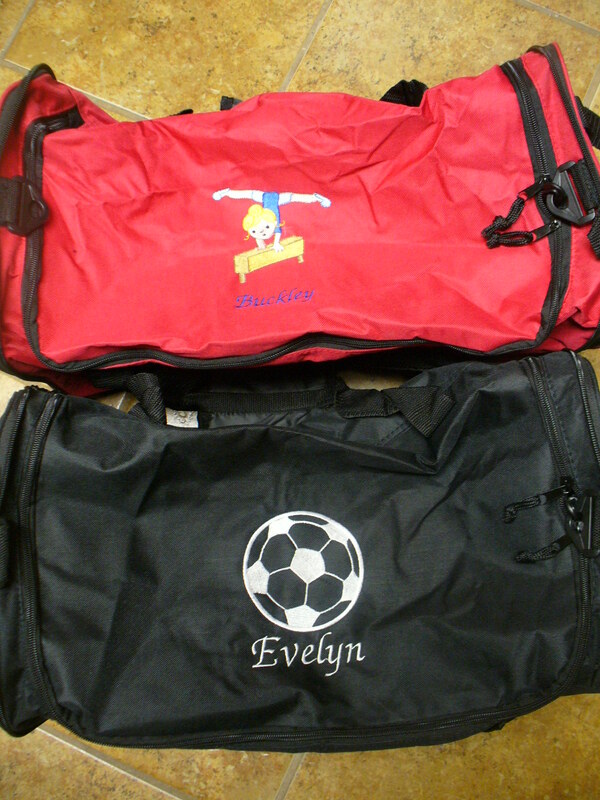 Finally, I had the joy of embroidering these duffle bags for some sweet little girls up in the northeast for their sports activities. I sure hope they enjoy them. I had tons of fun seeing the designs stitch out so nicely. If you would like for me to create something just for you or someone you care about, please let me know. I have such fun with these types of projects! Just comment below or send me an email. If nothing else, I’d love to hear what you think. I’ll keep on creating and sharing my projects from here. At Home.